The SES Wreath and Poinsettia Sale is a school-wide fundraiser that benefits our entire community. 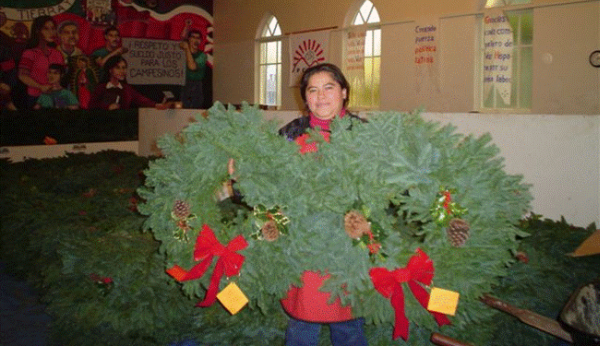 This year our wreath sale will again support both Sunnyside and Mujeres Luchadoras Progresistas (Women Striving for Progress). Mujeres Luchadoras Progresistas (MLP) is a group of farm worker women who create economic development and promote leadership among women in their community. Their wreath project has made a substantial difference in the lives of farm worker women and their families. The holiday season is the time of the year with the least amount of farm work available and a time when families struggle most to pay the rent and provide for their families. The money that women earn through the wreath project goes towards their familyâ€™s household expenses: rent, utilities, holiday expenses, warm clothing, and food. Supporting MLP allows Sunnyside to exercise what we try to teach our kids, and illustrates what we can accomplish as a community. Orders are closed for this year. Thank you for all your support!